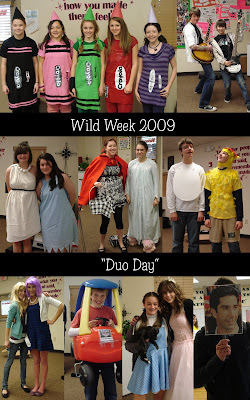 Today was "Duo Day" and everyone came dressed as part of a duo or group. As you can see from the pictures below there were a lot of fun costumes... including a box of crayola crayons, the chicken and the egg, Wilma and Betty, Little Red Riding Hood and her granny, among others. For all those inquiring minds, I didn't post a picture yesterday, but I did dress up for character day - I was Old McDonald. And then today, I was Mary Kate Olsen (during her bag lady clothing phase).